NASA explains how to locate the station once you receive your alert (Credits: NASA). NASA has launched a new service to encourage people everywhere to take a moment out of their busy evenings to look up. Those who sign up for “Spot the Station” will receive a message a few hours before the International Space Station is expected to pass over their heads. “The space station looks like a fast-moving plane in the sky,” the program explains, pointing out that as the third brightest object in the sky behind the Sun and the Moon, ISS is easy to see, if you know where to look. 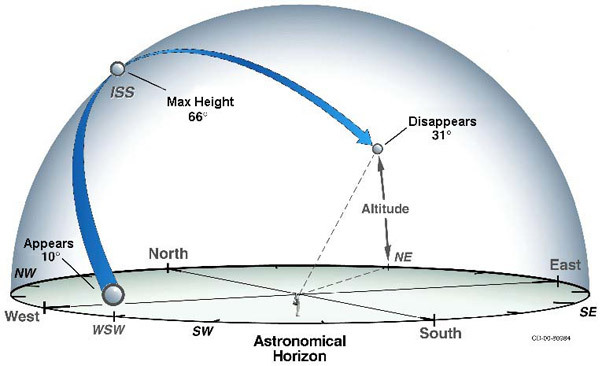 The service to open to anyone around the world, although those located above 51.6° latitude may have limited viewing. NASA’s Johnson Space Center routinely tracks 4,600 cities for station sighting opportunities.